What is ProSeries Fixed Asset Manager? ProSeries Fixed Asset Manager is an accounting software that automatically tracks assets and their depreciation throughout their lifetime. The Intuit application allows you to keep a record of your asset purchases and sales throughout a period so you are aware of your financial activities in that regard. With ProSeries Fixed Asset Manager, you can seamlessly manage multiple assets simultaneously. It lets you save time, especially when you are modifying information fields. On top of that, the software enables you to track numerous fixed assets rapidly. Additionally, when the period for reporting arrives, ProSeries Fixed Asset Manager provides you with 35 predefined reports that you can quickly fill up. However, if that is not enough, you can run the Report Wizard to create a custom report. ProSeries Fixed Asset Manager allows you to keep track of your fixed asset purchases and sales. This way, you are continually aware of which property you have in hand and the financial resources required for their upkeep. Additionally, you can see how much your business gains from asset sales for you to make decisions about further acquisitions and trades. Depreciation calculation can be a challenging task. However, you can easily surmount it with ProSeries Fixed Asset Manager as the software automates the process. Other than that, the application also creates projections of your fixed assets’ depreciation throughout their lifetimes. With this relevant information on hand, you can judiciously resolve when to maintain or update your properties. If you have a long list of properties and luxury autos, ProSeries Fixed Asset Manager can calculate their values and limitations over time in one go. This saves you time and immediately provides you with all-inclusive information. ProSeries Fixed Asset Manager comes with 55 predefined reports. Among them are General Ledger reconciliation, different depreciation reports, and personal property projection. However, when you need reports that are not included in the standard suite, you can generate your own using the Report Wizard. This tool allows you to produce reports that contain the information you require swiftly. In the case that you have unused fields, you can declutter your screen by removing them. ProSeries Fixed Asset Manager enables you to do this for you to maintain a clean workspace that is conducive to productivity and efficiency. If you are considering ProSeries Fixed Asset Manager it could also be a good idea to investigate other subcategories of Best Fixed Asset Management Software listed in our base of B2B software reviews. Enterprises have different needs and requirements and no software solution can be perfect in such a scenario. It is useless to try to find an ideal off-the-shelf software app that meets all your business wants. The intelligent thing to do would be to adapt the application for your special requirements, employee skill levels, budget, and other aspects. For these reasons, do not rush and pay for well-publicized leading solutions. Though these may be widely used, they may not be the ideal fit for your unique wants. Do your research, investigate each short-listed platform in detail, read a few ProSeries Fixed Asset Manager reviews, contact the vendor for clarifications, and finally select the app that offers what you need. How Much Does ProSeries Fixed Asset Manager Cost? Intuit has a single enterprise pricing for ProSeries Fixed Asset Manager. If you are interested in the software, you can purchase it directly from the website and immediately access the online download files. We realize that when you make a decision to buy Fixed Asset Management Software it’s important not only to see how experts evaluate it in their reviews, but also to find out if the real people and companies that buy it are actually satisfied with the product. That’s why we’ve created our behavior-based Customer Satisfaction Algorithm™ that gathers customer reviews, comments and ProSeries Fixed Asset Manager reviews across a wide range of social media sites. The data is then presented in an easy to digest form showing how many people had positive and negative experience with ProSeries Fixed Asset Manager. With that information at hand you should be equipped to make an informed buying decision that you won’t regret. 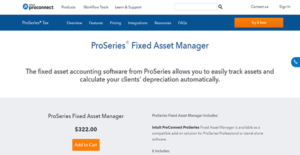 What are ProSeries Fixed Asset Manager pricing details? What integrations are available for ProSeries Fixed Asset Manager? If you need more information about ProSeries Fixed Asset Manager or you simply have a question let us know what you need and we’ll forward your request directly to the vendor.